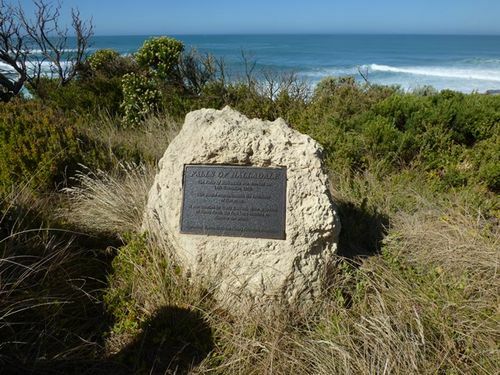 A plaque commemorates the centenary of the sinking of the "Falls of Halladale" in 1908. The four masted barque Falls of Halladale was 102 days out from New York when it ran ashore at Peterborough at 3 am on the morning of 14th November 1908. Within minutes, water poured into the holds and the crew safely disembarked and rowed for three hours until they beached at the Bay of Islands. The vessel grounded in fair weather on an ENE tack. A mist over the land created an optical illusion of a distant horizon, and the crew thought the ship was 10 miles off the coast when it was less than one mile away, heading for the rocks. When the danger was discovered, it was too late. The anchors could not be let go in time, and the ship had no headway to change tack. The Falls of Halladale struck heavily amidships, about 200 yards from shore. Soon after abandoning the ship, the crew found the stern awash with breakers sweeping over the decks as far as the foremast. The vessel lay in a small bay just to the west of Peterborough with its sails set, and provided a spectacle for sightseers. Two salvage ventures proved to be financial disasters. The captain of the Falls of Halladale was found guilty of a gross act of misconduct in that he carelessly navigated the vessel. His certificate was suspended for six months.